PlayOn’s streaming-video DVR gets new scheduling and ad-skip features, and its developer hints at bigger plans to come. Netflix and other online video services might wish that people didn’t know about PlayOn, but the DVR for streaming video is becoming harder to ignore. 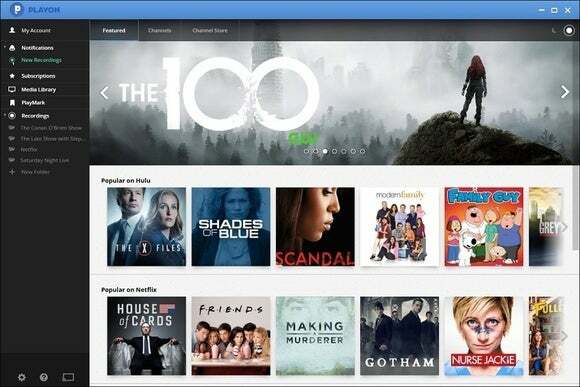 Last year, PlayOn quietly released a major update for its Windows software to emphasize DVR features. 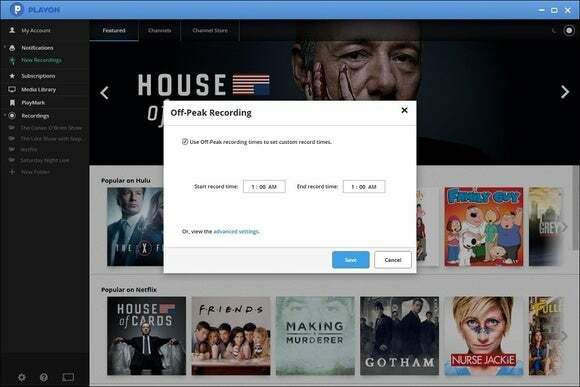 With a $60 lifetime license (or monthly payments of $5), users can record videos from dozens of streaming services, automatically skip the commercials on ad-supported shows, and stream videos from the PC to phones, tablets, game consoles, and connected-TV devices. PlayOn has now come up with a name for its headlining feature: “SVR,” short for Streaming Video Recorder. It’s also added a couple of helpful features, including ad-skipping in PlayOn’s mobile apps and a recording scheduler, so users don’t need to hog bandwidth during evening hours. The hope is that people who hate losing Netflix shows to expired licensing deals, can’t stand sitting through ads, or don’t want to grapple with limited streaming bandwidth will finally take notice. When you first setup PlayOn, it loads a lightweight media server program that runs in the background on your PC. This is how PlayOn monitors for recordings and streams videos to your other devices. For the actual recording, PlayOn employs some trickery, playing and capturing the video through an invisible Internet Explorer window. The videos themselves are stored as MP4 files in whatever directory you want; you don’t even need the PlayOn app to access them. Just note that PlayOn embeds your name, email, and IP address at the beginning of each video to “keep people honest,” Holland said. PlayOn’s new scheduling feature (accessed through the crescent moon icon at top-right) lets you download when bandwidth is more plentiful. Watching directly in the PlayOn app has benefits, however: You can view all your recordings in organized lists, skip through advertisements, and send videos to your TV device of choice, using a long and varied list of methods (more on that later). PlayOn also offers iOS and Android apps, which can stream videos directly or act as a remote for casting to other TV devices. As for ad-skipping, PlayOn doesn’t actually remove ads from the video file. Its video player just knows when to skip over them. Unlike the ad-skip solutions on TiVo and Dish Hopper DVRs, which are programmed by humans, PlayOn uses an automated system. This means it should work with any ad-supported show, though MediaMall’s Jim Holland wouldn’t get into details on how the system works. One downside to this whole setup: To record Netflix, PlayOn needs to install Microsoft Silverlight, a plugin that otherwise serves little purpose on the modern web, and sometimes becomes a source of security vulnerabilities. Still, violating a terms of service agreement isn’t the same as breaking the law, and PlayOn has long maintained that users are just exercising the same rights they had with VCRs. The fact that PlayOn wasn’t sued into oblivion after launching its first recording features four years ago seems to bear out that claim. Right now, PlayOn does rely on obsolete software to function. It records videos through Internet Explorer, using plugins like Microsoft Silverlight and Adobe Flash, all of which could be phased out by their makers and by websites over time. But in an email, MediaMall CEO Jeff Lawrence gave an unfazed response about the bright future of using HTML5. “We have already developed the ability to use embedded Chrome (or 'CEF') instead of IE, and will be selectively migrating certain channels to it as early as next week,” Lawrence said. Having built up a fully-functional streaming DVR while eluding legal troubles, PlayOn is now looking to expand its presence. Right now, the process for getting PlayOn videos onto TV devices is a bit convoluted. There’s no native interface for browsing your recordings on Fire TV or Xbox consoles, while PlayStation consoles require you to browse through Sony’s media player app. Roku apparently wasn’t comfortable hosting a full PlayOn app in its official channel store several years back, so users must download a private channel if they want to browse their videos through that set-top box. (A separate Roku Channel Store app allows for selecting videos on a PC and casting them to the TV.) It all makes PlayOn seem sort of illegitimate, even if it’s not illegal. 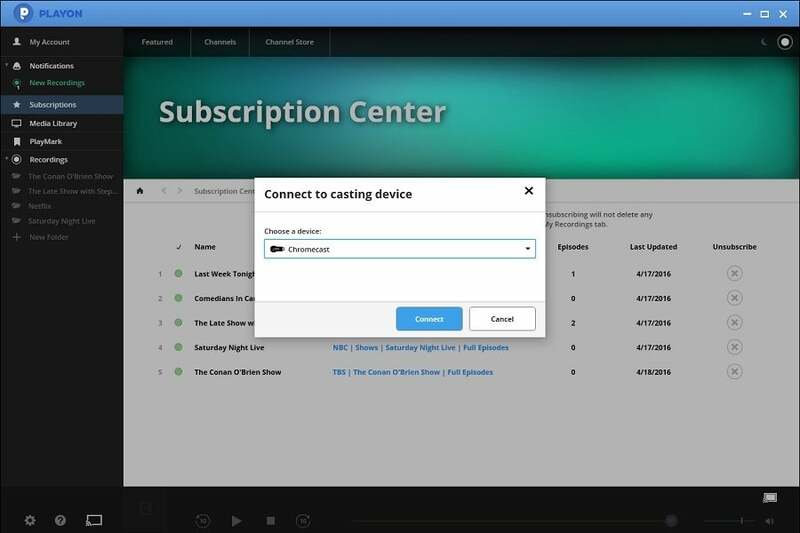 PlayOn’s PC software lets you cast video to TV devices such as a Chromecast. PlayOn might soon push for more legitimacy. Holland said the company has a Fire TV app awaiting approval, and hasn’t ruled out native Xbox One and PlayStation 4 apps down the road. PlayOn might also try to get its full Roku app approved for the official Channel Store. Holland noted that screen-mirroring on devices like Chromecast have helped normalize the idea of sending web videos from a PC to the TV.